DC216Use this if you need a display with buttons and some digital and analogue I/O. Use as a stand-alone controller or as an expansion module. DR240Use this if you need opto-isolation and mains voltage switching, 240VAC @ 10A. Use as a stand-alone controller or as an expansion module. 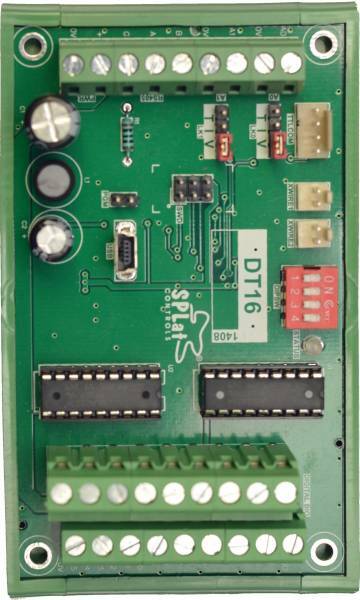 DT16Use this if you need lots of digital I/O and some analogue inputs. Use as a stand-alone controller or as an expansion module. DR8Use this if you need relay outputs and some digital inputs. Use as a stand-alone controller or as an expansion module. 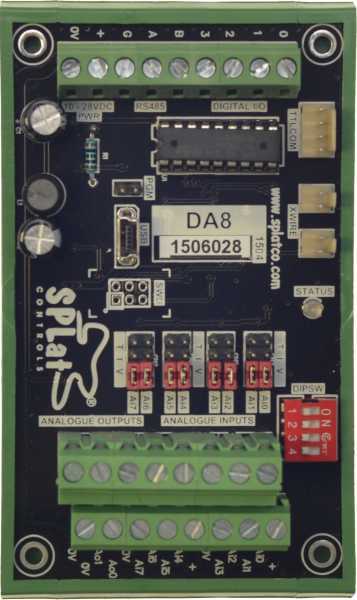 DA8Use for 8 analogue inputs, 2 analogue outputs and some digital I/O. Use as a stand-alone controller or as an expansion module. DPH1Use for pH measurement with some digital I/O. 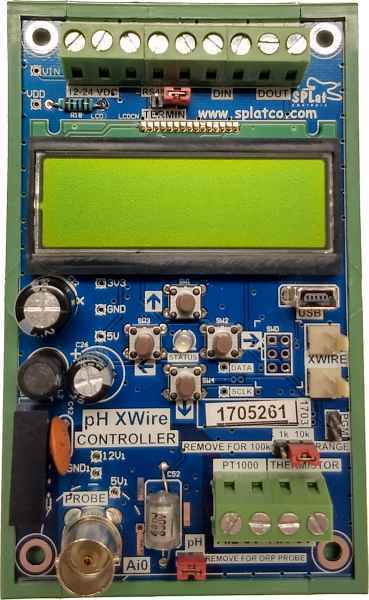 Use as a stand-alone controller or as an expansion module. 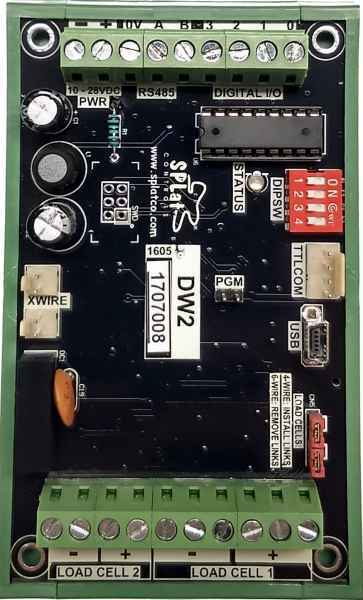 DW2Use for load cell measurement with some digital I/O. Use as a stand-alone controller or as an expansion module. 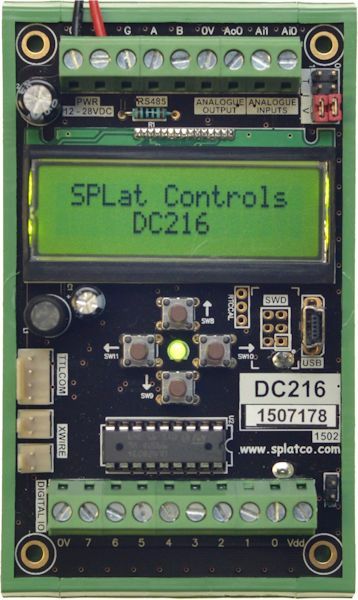 The SPLat DIN Family of controllers are an ideal solution for any job that needs a cheap programmable PLC inside a cabinet. Each product in the DIN Family is a fully programmable controller, so it can either be used by itself or wired up with other family members to get more I/O. 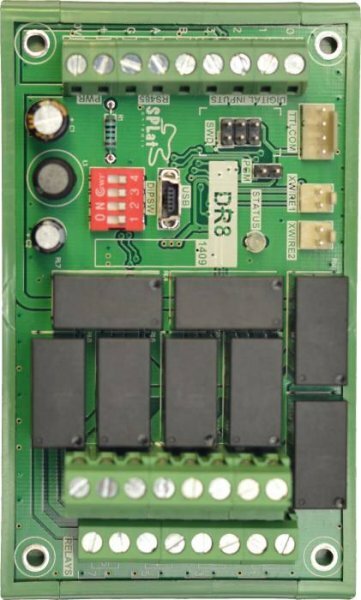 The DPH1 is a board designed to interface raw, unamplified pH probes and ORP probes. The controller comes pre-calibrated for an "ideal" pH probe (pH7 = 0 mV and pH4 = 177.48 mV at 25°C) and for most applications this will do fine. To get better accuracy, the intended probe should be calibrated using fresh pH buffer solutions on the controller it will be used with. Supplied pre-programmed with software to allow it to be immediately deployed as an Xwire and MODBUS peripheral or as a stand alone pH/temperature gauge. 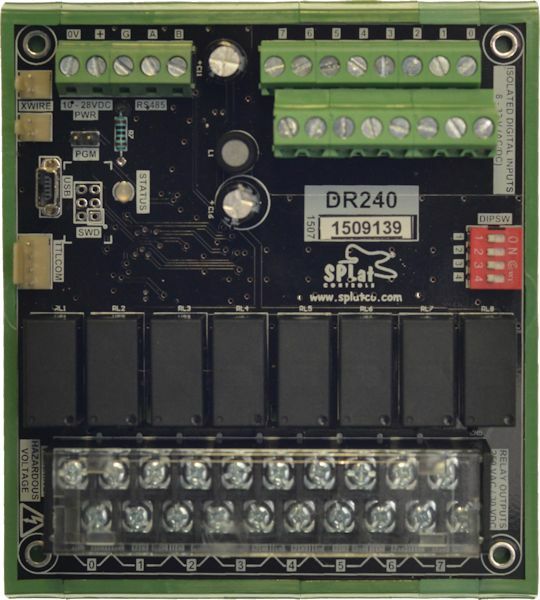 Fully programmable for specific applications (also field upgradable). Extremely high input resistance pH/ORP BNC input with galvanic isolation to eliminate ground loop problems. pH circuitry is conformally coated. Option of DIN rail mount or PCB mounting. Once downloaded, unzip, right-click "splat_serial.inf" and choose Install. The firmware revision history is available here . DIN Family: pH measurement, 2 x d/in, 2 x d/out, TTL Serial, RS485. Includes DIN mounting kit. 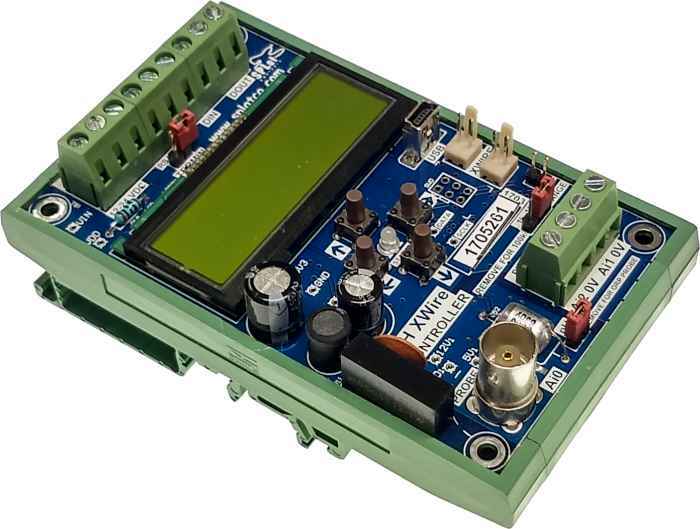 DIN Family: pH measurement, 2 x d/in, 2 x d/out, TTL Serial, RS485. Without DIN mounting kit.